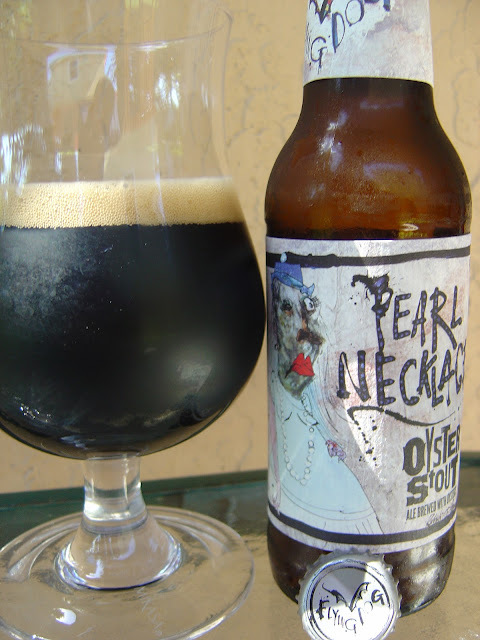 Today I'm drinking Pearl Necklace Oyster Stout brewed by Flying Dog Brewery in Frederick, Maryland. 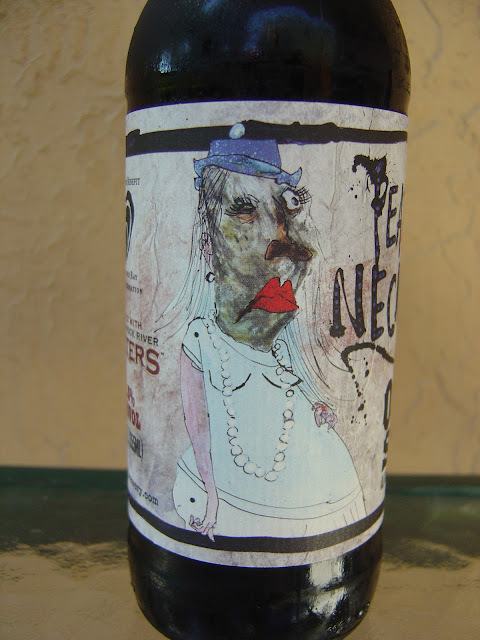 I love the label art by Ralph Steadman that goes along with all of Flying Dog's beers, this being no exception. This particular label shows a granny dog seemingly dressed for church, all decked out in her Sunday best dress and hat, bright red lipstick and long string of pearls. The side of the bottle lets you know that this is a charitable beer as well, with proceeds benefiting Chesapeake Bay Oyster Restoration. Finally, if you didn't know why they call this an oyster stout, it's because it was brewed with Rappahannock River Oysters. Nice chocolate and roasted coffee aroma. There is a bit of a salty smell too, but that could be more imagination than anything else--it's faint. Chocolate and coffee flavors also dominate the beginning, a little sweet to start. Then some roasted malts come through rounded out by a bit of smoke. Salt and hops marry together and add interest and balance to the initial sweetness. The saltiness is not overdone, something I was worried about even as I was buying the bottle. Body is thin-ish, medium. Very smooth with no harsh roast. There is a bit more of that salty smokiness at the finish and into the aftertaste. Very drinkable. Pretty good flavors. Not bad. Try for yourself! Oh, and since we're talking Flying Dog and Brewery Art and Ralph Steadman, check out these pictures that the famous Ed Roberts took while at the brewery during his trip to SAVOR this past week.